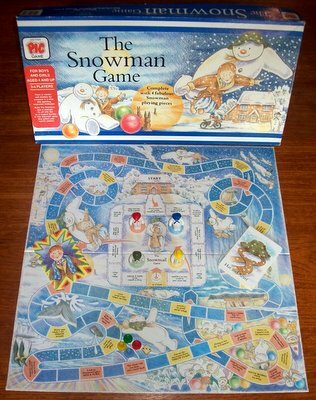 'THE SNOWMAN GAME' BOARD GAME: There is wonder and mystery for everyone in a crisp and sparkling snow-clad landscape. Build The Snowman at midnight, fly off with him on a magical journey to The Snowman Party and collect your special present. The game is complete and in good. The box, which shows signs of storage wear, is sturdy and intact. The game board is beautifully illustrated and presents itself in very nice condition. The four Snowman playing tokens and cards are all in excellent condition. This is visually stunning game which, in so many ways, epitomises the special spirit of Christmas.